What Constitutes Effective Security Awareness Training? Employees are a critical part of an organization’s defense against many IT security threats. Just as having the correct technology solutions is important, training personnel to recognize security threats is a critical part of any security strategy. As part of that strategy, organizations must consider both the content and the training methods. 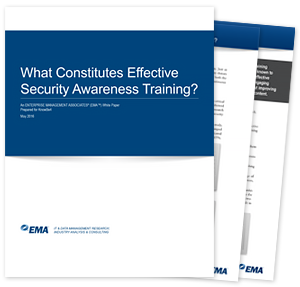 But what constitutes effective security awareness training? Read this whitepaper and find out what works to drive significant behavior change toward employees making smarter security decisions. KnowBe4 is the world's most popular integrated platform for awareness training combined with simulated phishing attacks. We help thousands of organizations to manage the continuing problem of social engineering.